and diligently use your eyes and ears, and some of the sweetest secrets of the sod are sure to be revealed to you. A quote from the Kearton Brother's, Wild Life at Home. Setting off at 17:00 myself and Roger headed out. On approaching our destination a Roe Deer and her yearling stood on the road, jumping the dry stone wall as we approached, but not travelling far, happily feeding just the other side. This was to be the first of our close encounters. Parking up and walking through the forest, along an old wall colonised by heather, mosses and lichens, it was quiet, a Woodpigeon breaking cover here and there, and the sound of Song Thrush singing from the uppermost branches. A short 1/4 mile walk and we were there, sitting down with are backs against a 5ft dry-stone wall, waiting for the light to fade. A Common Buzzard made the first appearance heading to roost, followed by a couple of Grey Herons.Tawny Owls began calling and the distinct bark of a Roe Deer could be heard nearby, very nearby, the sound echoing off the dark wall of conifers, so much so that it sounded like there was a second individual deep within the forest. As I was scanning the boundary between moor and forest, Roger nudged me, and in an excited whisper he said 'Cain, Roe Deer'. Looking up a head could be seen rising just above the horizon, looking directly towards us, I whispered back 'don't move'. There was little wind, the slightest of breezes was hitting my right cheek, but at the moment we were down wind of the deer. Motionless we sat and watched the deer approaching closer and closer, steadily moving down wind of us, it knew something was there, as it walked it stomped, the sound echoing, it could almost be felt. Still it was getting closer, down to 10-15 metres, standing above us and as we sat in the heather. It let out one bark, so close that I jumped. We watched for another 5 minutes or so before it had walked round, putting us up wind, and it was off, once again below the horizon. By this time the light had dropped significantly, Red Grouse could be heard in the distance, and an odd Woodcock passed by roading. At 18:45 I heard the faintest of hoo hoo hoo hoo's, then wing clapping, and then a Long-Eared Owl appeared, flying in front of, then above the tree's. At least two birds were present and continued to show on the boundary edge, and above the forest for the entirety of our time there. A second owl also showed, out the corner of my eye I caught movement to my left, just below the top of the wall, following its line, on our side! First thought was Long-Eared Owl, but as it appeared out the darkness it was clear, Barn Owl. Continuing its path, it flew just above our heads, no further away than my arm stretched. It passed, and then returned hovering just above us, slightly higher this time. Engrossed in the Barn Owl, we just caught sight of the Long-Eared Owl approaching, as the Barn Owl moved off the LEO returned to its forest. Walking back to the car the screeches of the Barn Owl pair could be heard in valley, the Long-Eared Owls wing clapping from the forest boundary, and the Tawny Owl from its interior. A great night. enjoyed very much, I was there in spirit.. nostalgia! Very nice report and great image of course Cain. Cracking account Cain. I almost felt the Barnies wings overhead. Did you attempt any video footage in the fading light ?? Thanks John. I didn't attempt any video, by the time the Owls were out t was to dark, and if either of us moved the Roe Deer would have been off ! I did record some sound, but I haven't played it back yet. 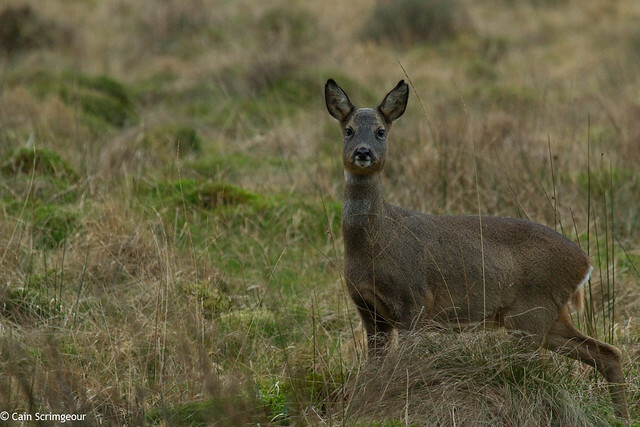 Nice pic of the Roe Deer. Yup being 'quiet and unseen' is a must for those who are serious about seeing wildlife (in the 'wild'). A shame not everyone realises this, lol. Love that roe deer photo!